For the little hero in your life, this firefighter badge is sure to be a joy. 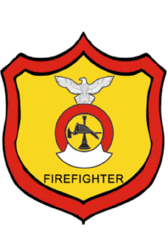 This badge has a firefighter logo and the word firefighter on the badge itself. Its bright orange and red design will stand out in any firefighter costume.